This post is the biggest cop out post ever and is brought to you by a severe case of writer’s block. And, frankly, dear readers, it’s time you pulled your weight around here. 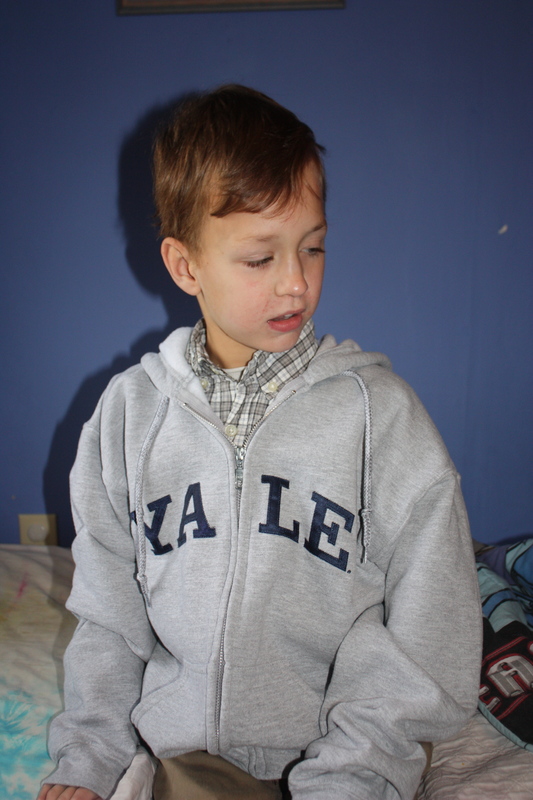 Aidan and I are headed to Yale in a few weeks. Yes, we really are all that. We’ll be guest lecturing to a class of pediatric nursing students to give our two cents about living in Disability World. So, if you had the chance, what would you want the medical professionals in your life to know? Has there been a moment when one of them said or did the exact right thing, or maybe, the wrong thing? What questions would you have for a parent of a child with a disability, something you want me to be sure to share? You don’t have to be the parent of a child with a disability to chime in. I think many medical issues would be transferable. Here’s some of what I said last year and how bossy I looked saying it. I’m not sure if this even counts, but my first thought was, “I wish my son’s pediatrician knew more about breastfeeding.” She never breastfed her 4 children and didn’t receive much professional training on it, even though she specializes in children. She regularly pushed formula on us, instead of respecting that I am a bf mom. I would never push bf on a mom that is ff. I just felt disrespected and jipped. I received a lot of questionable and sometimes even flat wrong advice from her on this topic. I know that it is impossible for professionals to know all about all, and I am really blessed with a wonderful lactation consultant. But I know if Eli’s doctor didn’t give off her misinformation as fact, I would probably be more apt to trust her on other “factual” advice. Oh yes, so true. We had a similar experience with a different medical issue. Thanks for sharing. L – Thanks for sharing your story. That’s so frustrating and I agree wholeheartedly that parents are experts and the medical community and families need to work together. I’m glad you found a neurologist to work well with. Also, you make a good point about how a diagnosis (or lack thereof) is life-changing and parents can quickly be draining their financial resources. Stay tuned for follow up. I have always wished that Doctors and other medical professionals knew more about severe behavior issues as manifested in individuals with autism, TBI, and mental illnesses. Kindness, understanding, being willing to bend the rules a little can go along way in making doctor visits more comfortable for such people. My daughter included! Oh, BTW- knock ’em dead, good luck and all that! It’s quite cool that you have been chosen for this task!! I’ll be looking forward to hearing all about it! Thanks! I really love the opportunity to share our story and make a difference. That’s why I want to have as much input as possible. You’re not the only one who has said it’s important to bend the rules; each child is unique. And you’re right, there is a level of behavioral education that needs to take place. When we went to Boston, we were in the office talking for a looooong time to the doc and Aidan’s chair was powered down. He was wonderful but I knew that had to be frustrating for him. Thanks for sharing this. Hello Heather, my name is Jenn and I am a PT student, I shadowed at SB PT this summer and had the pleasure of speaking with you and working with your son a few times. I have not worked a lot with children who have disabilities but I wanted to share an experience I had that was positive, because so often we only hear the negative. Two years ago I had to have an emergency appendectomy while I was up in Bangor for school (I’m from NY, family is in NY). All I had by my side were my roommates which I was very thankful for, however not having my mom nearby was really tough. The nursing staff/surgical staff were my “mom’s” sent from above. I could not have had a better experience going into and coming out of surgery. They sat on my bed and held me, they asked about my home life, walked me through the entire procedure, held my hand while I went under anesthesia and brought me more blankets than I probably needed when I was done. They really went out of their way to make sure I was as comfortable as I could be. Still to this day, that all meant more to me than they probably knew. This was probably all in a day’s work for them, but I was so thankful to have such a caring bunch of people taking care of me. Sometimes we don’t give credit where credit is due, and this was definitely a moment were they said and did the exact right things when needed. Wow. What a great question. Holy Cow – a big yes. Absolutely. Patients are people too. This is great! Thankfully, we have been blessed with great nurses and dr’s who always have taken their time with Charlie Claire and our family. Good luck, can’t wait to hear about it!